Royal Liverpool Childrens Hospital, Heswall - a Memory of Heswall. I was in Heswall Hospital a number of times in the late forties, suffering from Bronchiectasis. I always went into Hugh Owen Thomas ward. It was a long ward seperated by sliding doors, the girls one end, and the boys the other. I remember sleeping out on the verandah every night unless it was raining or foggy! On fine days the nurses would pull our beds out onto the lawn. Every other night we would have to sleep over 'the nelson', the boys one night and the girls the other. It was a contraption that fitted over the bed frame, and we would sleep over it with our bottoms in the air! It was to aid postural drainage for patients with chest problems. The views from the ward were amazing. There were rolling lawns down to woodland, and one could see right over to the Welsh hills. The other thing I remember was, there was only visiting once a month, which to a child of 6 or 7 years old, was an eternity. As I came from Liverpool, it was a trek for my mum and dad, as they didn't have a car at that time, so it was a bus, then a train, then another bus - it used to take them all day! Also of course, sweets were rationed then, and my uncle owned a sweet shop, and used to send me a goody bag. However, all sweets were taken from the patients, and put in a sweet tin and everyone in the ward would get a sweet after our evening meal. But my dad used to hide some in my pillowcase! A memory shared by Maureen Alcock Nee Woods on Jul 17th, 2012. Send Maureen Alcock Nee Woods a message. 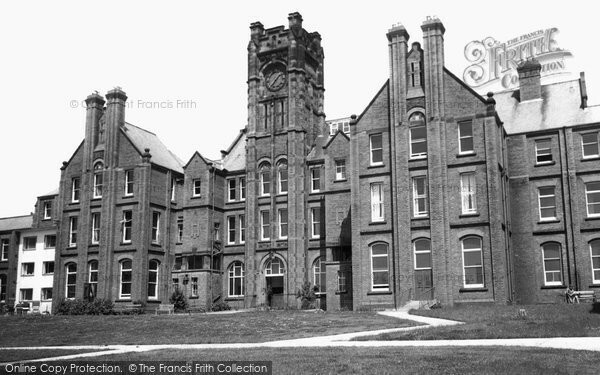 I think this was the ward I was in, in the early fifties. My bed was next to the wooden partition. I was there because I was a TB contact, I've only just found that out after sixty years. My Mother had TB. I remember a few of us got moved to the girls side, some sort of vomiting bug in the ward, so we were isolated, still didn't stop the school lessons. I was moved around different wards during my stay, to this day I don't know how long I was in there. One ward had a massive table down the middle were we all sat and had our meals. Add a memory of Heswall.